Photo by Americas Market Intelligence. Consultancy firm Americas Market Intelligence or AMI issued this week a lengthy report on the risks of mining in Latin America. One of the chapters focuses on security hazards and reveals that such perils are not necessarily provoked by illegal groups. According to AMI, sometimes local community members that opposed mining operations can cause security risks by deploying roadblocks and aggressive or invasive tactics at the mine’s perimeter. If the local or federal government does not want to get involved in the issue for political reasons, then the miner is left on its own to deal with the disruption. As an example, the consultancy firm presents the case of Gran Colombia Gold’s (TSX:GCM) mine in the department of Caldas which was blocked in the summer of 2017 by independent miners, whose protest actions became violent at times. Only after 42 days of rallies was the Canadian miner able to resume operations. 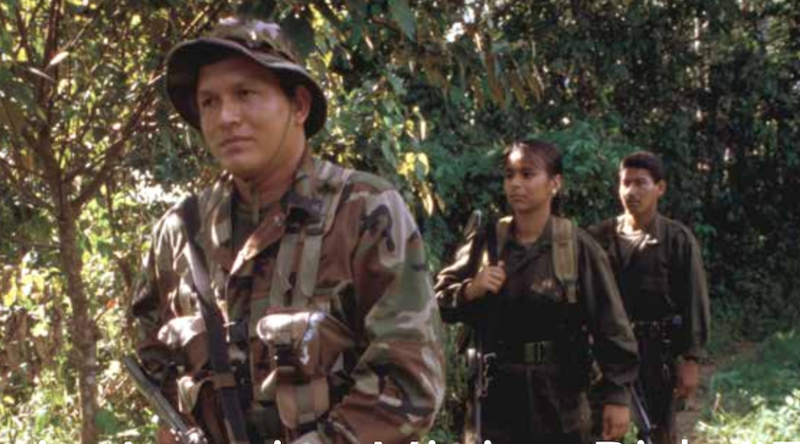 In the Colombian context such as the one where Gran Colombia operates, AMI says it is common to see lawyers and local indigenous representatives engaging the mine in elaborate extortion schemes, usually triggered by environmental damage or the possibility of it. Similar situations take place in Chile. 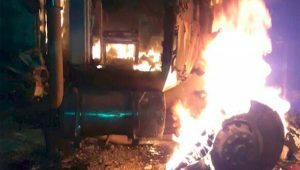 Trucks burnt by artisanal miners protesting against a subsidiary of Canadian-based Gran Colombia Gold, in Colombia's Antioquia department. Photo from Noticias Caracol. The document also states that mining unions in Latin America can be very aggressive as well and some of its members can become security risks for companies, particularly if they have ties with organized crime. The report details the case of unions in Mexico that were traditionally funded by the Institutional Revolutionary Party, known as PRI. Such labour organizations lost their main source of income when, in 2000, the party lost a presidential election for the first time in 70 years. “The national mining union split into factions, some of which began collaborating with organized crime who paid their bills. Torex Gold’s (TSX: TXG) operations in Guerrero were undermined from an operational security perspective in recent years, owing directly from a dispute with its union, which purportedly has ties to organized crime,” the document reads. When it comes to organized crime in itself, AMI suggests that miners need to view such illegal groups as businesses and not as simple security threats. In the consultancy’s view, the reasoning behind this logic is simple. Criminal bands tend to have a hierarchy and different business divisions, each in pursuit of profits. “If one business division, such as drug trafficking, is shut down by strong enforcement, revenues must be found in other areas, like kidnapping or extortion,” the firm’s experts state in the paper. In other words, miners operating in areas under siege by organized crime need to keep track of what is happening with such organizations because even if they have never been approached or attacked by them, a change in conditions might put a target in their operations. Rising mineral prices and profits may also awaken an interest in illegal mining or in extorting a miner. “In Mexico, Brazil, and Honduras, for instance, some gangs are known to extort the vendor suppliers of mines, extracting a ‘war tax’ to guarantee their safety. These costs are passed onto the mine via invoices for real goods and services billed at inflated numbers.” This practice is also known to take place in Venezuela. Police corruption is another risk companies need to take into account. In some countries, organized crime can only be stopped by federal police and military forces working together with a mine’s own security forces. AMI presents the case of the state of Guerrero, an important mining jurisdiction in southwestern Mexico. The area is also home to 20 different criminal groups, ranging from gangs to drug-producing cartels and police corruption is rampant. This means that it is common for different enterprises, amongst them mining companies, to be extorted and not finding support in local authorities. Another thing to take into account, says Americas Market Intelligence, is the fact that criminal groups sometimes control illegal miners. In Colombia, for example, cocaine producers and distributors help finance illegal mining to help launder their drug proceeds. What’s a miner to do? When it comes to informal miners, Americas Market Intelligence suggests that companies need to do their due diligence and know ahead of time how they operate, as well as implement a sensible policing strategy with official help. 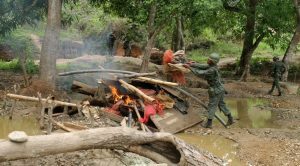 AMI also recommends to thoroughly assess the presence of illicit organized crime and nearby drug-smuggling corridors in the regions where they plan to start a mining operation, because illegal groups’ financial interests may intercede with a future mine. “Even legitimate competing interests like farming or indigenous groups may resort to violent tactics if they feel threatened by a new industrial mining project. Security threats are often the result of a much more fundamental economic threat or opportunity perceived by local interest groups,” the document states. The Florida-based consultancy believes that, given how corrupt police forces are in some countries, every mine should be self-sufficient and rely on its own security personnel and strategies for protection. “Directing an in-house security apparatus requires sound management and a constant feed of local intelligence that identifies both opponents and allies of the mine and monitors problems before they escalate into violence,” the firm’s report says. Despite this recommendation, AMI suggests that self-sufficiency on the security front should not preclude miners from allying with other local businesses as well as building bridges with local political stakeholders. “The more local players are aligned with the interests of the mine, the less likely they will work with or even tolerate illicit groups who oppose or threaten a mine,” the document concludes.